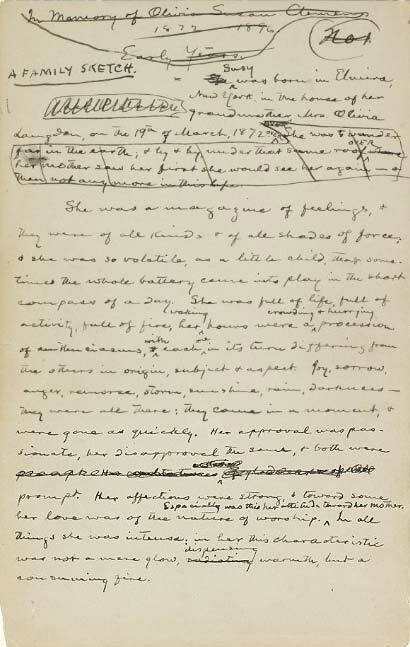 Sotheby’s New York sold the Mark Twain Collection of original letters, manuscripts and photographs, as part of a larger sale of the James S. Copley Library, June 17, 2010. The Mark Twain Collection consisted of about 200 items, valued pre-sale at approximately $1 million and realizing $1,367,268. You didn’t have to be a millionaire to participate in this auction. 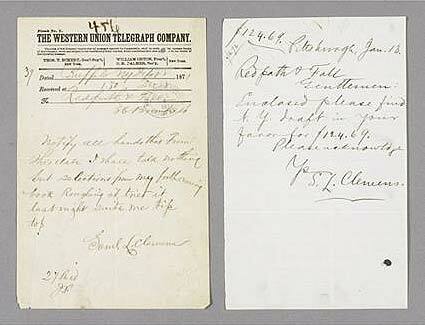 Many Mark Twain (Samuel Clemens) items sold for less than $5,000. Lot 471 was a lot of two items regarding the publication of his book, Roughing It, and sold for only $500. If Mark Twain didn’t interest you, the rest of the Copley Library may have. Some of the historical figures represented included George Gershwin, Albert Einstein, Mohandas Gandhi, Charles Lindbergh, and Isaac Newton, to name a few. Lots ranged in price from $500 for several items, up to $68,500 for a letter by Charlotte Brontë. 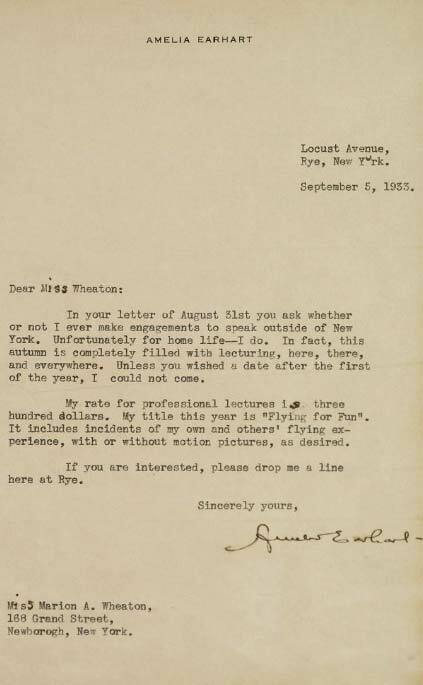 An amusing typewritten letter by Amelia Earhart, Sotheby’s lot 310, was estimated to sell for $2,500-3,500 and only brought $1,250. The entire sale of the Copley Library, including the Mark Twain Library, sold for $2,210,842. For the complete results of the sale, click on the following link. The James S. Copley Library results. 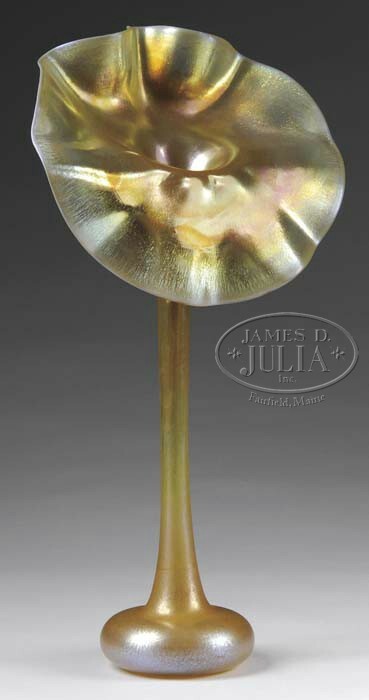 James D. Julia, Inc. held their annual June Important Lamps and Glass Auction on June 22-23, 2010. I asked Jim to write some comments about his sale. His response appears in its entirety at the end of this blog post. The sale was divided into many categories, some of which were soft, including Lalique, Wedgwood Fairyland Lustre, KPM plaques and French cameo glass, while others fared better, including Tiffany Studios items. Individual items excelled, even within weak categories. Many of the items that failed to reach reserve, and therefore did not sell, were a result of estimates that were too aggressive. I’ve repeated this point time after time — low estimates create interest and encourage bidding. The problem occurs when consignors insist on aggressive estimates and high reserves. What should an auctioneer do? He’s caught between a rock and a hard place. Should he accept the consignment and risk that the items won’t sell? There’s a lot of time, effort and money invested in items that don’t sell. Or should he not accept the consignment and possibly lose out on commissions? Tough choice. The correct answer depends on market conditions that change regularly. It would be wonderful for all involved if an entire auction had low estimates and no reserves. That rarely happens today, as most consignors are not willing to gamble. Julia’s auction is located in central Maine in the town of Fairfield. It’s a bit off the beaten path, about halfway between Portland and Bangor, just off exit 133 on I-95. Jim bends over backwards to encourage bidders to make the trip to Fairfield to attend the auction in person. He understands that live, in person, bidders are more valuable to the success of an auction than phone, Internet or left bidders. Julia’s offers incentives like free hotel rooms, free dinners, and free food at the auction. Even with those incentives, the crowd averaged only about 30-40 each day. The slack was taken up mainly by interest from the phones and the Internet. Tiffany Studios items were well represented in the sale, with the top seven lots all being Tiffany lamps. A pretty Tiffany 17″ Geranium lamp, lot #2315, was estimated conservatively at $30-40,000. As a result, there was considerable interest from many telephone bidders and the audience. A dealer, bidding on the telephone, was the winner, paying $63,250, including buyer’s premium — a result that easily exceeded the high estimate. Lot #2020 was the second highest French cameo glass lot of the auction. 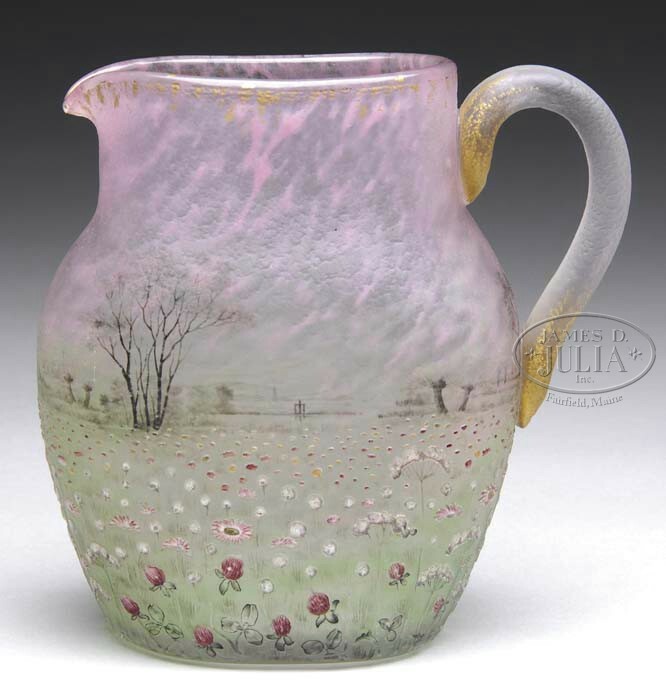 It was a rare and very desirable Daum 6¼” Prairie scenic pitcher. It sold near the high end of its pre-sale estimate of $10-15,000, reaching $16,675. Use this link to view the results of the entire sale. Scroll down the page and click on what interest you. You’ll have to register online before you can see the results. Registration is free. 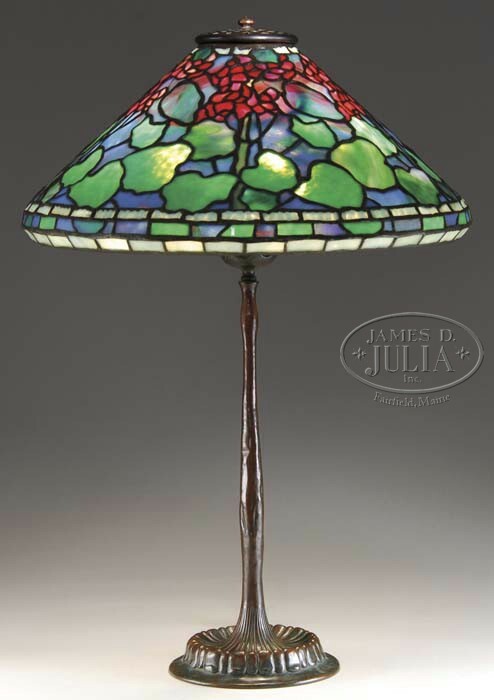 Julia’s June Lamp & Glass auction results. Following are Jim Julia’s comments about his sale. For the past few weeks leading up to our auction we have been filled with pride, anticipation, and trepidation. Pride because we had been told on numerous occasions that our upcoming glass and lamp auction was probably the largest, finest and most diverse grouping of this type that has been offered at any one auction anywhere in the world for the last couple of years. Anticipation because we had a considerable amount of monetary value and thus had the potential for doing well. Trepidation because this is a different world today the economies of the world’s and the collecting fraternities of the world’s are no longer what they were three years ago. This is a buyer’s market not a seller’s market and its exceedingly difficult to predict what is going to happen. We of course knew that because this was such a high-profile auction a great number of collectors would be watching its performance. If we were successful it would bode well for our company and for the glass and lamp collecting fraternity as a whole. Healthy prices create a sense of assurance and confidence for collectors to buy. Very poor sales results would serve as a depressing factor for the collecting fraternity as a whole. It’s important to note that our auction was not a huge accumulation of modernism, art nouveau and art deco that happened to include a few highly select and rare lamps and/or glass objects (truly rare, highly important and very valuable collectibles still tend to bring very strong prices). Our auction was a true cross-section of the art glass and lamp marketplace. It consisted of objects that would normally be found in the booths or shops of leading art glass and lamp dealers throughout the world. As such, the value ranged from a few hundred dollars to a hundred thousand dollars plus and included art nouveau, 20th century American art glass, paperweights, KPM plaques, lamps of all types, miniature lamps, French and English cameo glass, Fairyland Lustre, etc. We are proud and pleased to report that our auction was a success. Gross sales were just under $2 million and with the normal post-sale buying that takes place the week following an auction, the total gross should exceed $2 million. In addition there were some healthy prices; the most exciting of which were for desirable items that carried very realistic and/or conservative estimates. One of the most critical factors at auction in a down economy is not only the importance of quality offerings but more importantly realistic and conservative estimates. The more conservative the estimates the greater the interest in the object and the more likely it would do well when sold. Just as prices on the stock market readjust in new economies the same thing happens in collectible markets. One of the most difficult things in a down economy for an auctioneer is to try to figure out what the new market level is for various collectibles. Just because the consignor bought the object three years ago for a lot of money or because they were offered a lot of money for it four years ago or because someone sold a similar one five years ago for a lot of money, has nothing to do with the value of land in Florida, Handel lamps or G.E. stock today. The value of any object today is what the current market will bear, which in many cases is less. If G.E. stock (which used to trade at $38 but now is trading at $16) is offered at the former value of $38, it will not sell. It is no different for a Handel lamp or a KPM plaque; these things sell but only at current market value, not the old market value. Those consignors who insisted on aggressive reserves and/or high estimates in economies such as this will frequently be dismayed with the financial results. High reserves (and thus high estimates) simply disparage bidding participation and thus garner a low rate of return. Conservative estimates and reserves result in maximum participation, which in turn results in the greatest amount of the competition which therefore will result in the greatest rate of return. English cameo included a fabulous Junior lamp in shades of red and white estimated at $15,000-$25,000, it sold for $23,000! A beautiful 8 inch English three-color cameo vase conservatively estimated at $2,000-$2,500, went out at $6325. An outstanding offering of paperweights from an old collection carried strong reserves and thus prices were spotty. A beautiful cliché honeycomb estimated at a conservative $6,500-$8,500 saw lots of activity and finally sold for $10,350. There was a terrific offering of French cameo which performed adequately; not on 2007 standards but on 2010 standards. A beautiful Daum Nancy Prairie pitcher 6-1/4 inches high estimated at $10-$15,000, sold for $16,675. A Galle étude marquetry vase 7 inches high was estimated at $8,000-$10,000 and realized $12,075. There are always surprises at every auction which include bargain prices as well as some items which over perform. 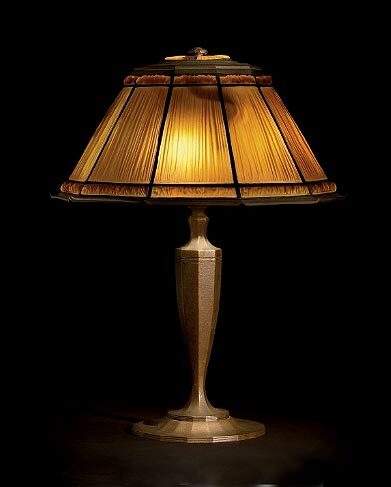 A beautiful American contemporary leaded table lamp estimated at $8,000-$10,000 sold for just under $20,000. Tiffany perhaps was in general one of the better performers (as it usually is). A beautiful geranium table lamp with a realistic but conservative $30,000-$40,000 estimate saw lots of bidding activity and finally sold for $63,250. 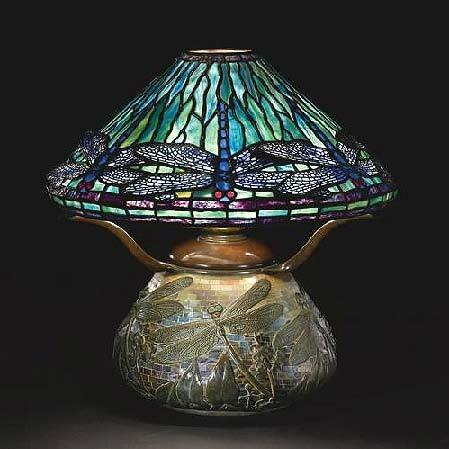 A nice Tiffany drop head dragonfly table lamp was estimated at $120,000 -$150,000. Based on recent sales of dragonfly lamps, this estimate was probably a little more aggressive than it should have been but the lamp still sold for just under $110,000. Another dragonfly without the drop heads was estimated at $55,000-$65,000 and sold for $61,000. 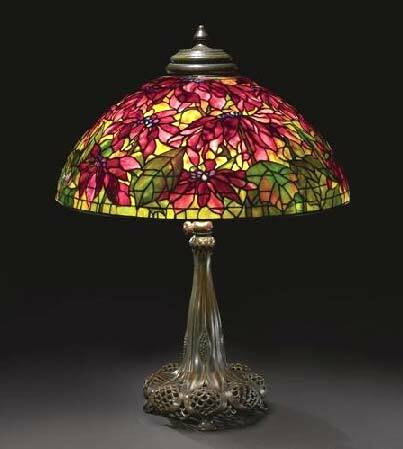 A great Tiffany Studios decorated senior floor lamp base estimated at $40,000-$60,000, finally sold for $47,150. The total low estimate of everything sold in this two-day sale was $1,596,150 but the total realized including buyers premium was $1,883,095 or a total of $286,945 more than low estimate. One last point about the collectibles fraternity today is that it doesn’t matter if you collect Galle, Tiffany lamps, rare toys, fine art or furniture; an important point to remember is this is a buyers’ market. 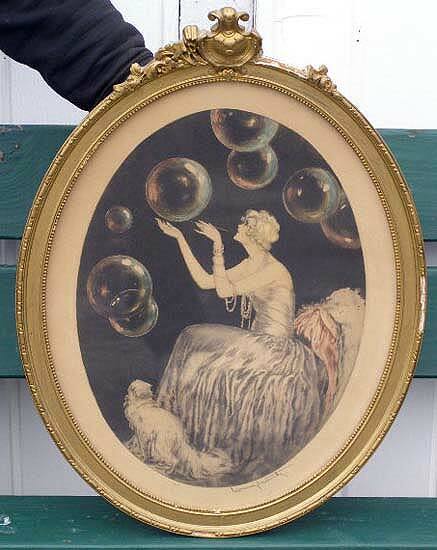 Consequently, there are consistently great buys available at auctions, shows, and shops. This is the best time in a collector’s life to be adding to their collection. During a sellers market as we’ve experienced for a number of years there is so much competition that there are rarely any good buys. But in a buyers’ market, prices tend to be lower and there are consistently bargains available. This is a fabulous time for collectors to be expanding their collection. Smart buyers in the stock market such as Warren Buffett take advantage of buyers markets to expand their holdings. Smart collectors take advantage of buyers markets to expand their collections! 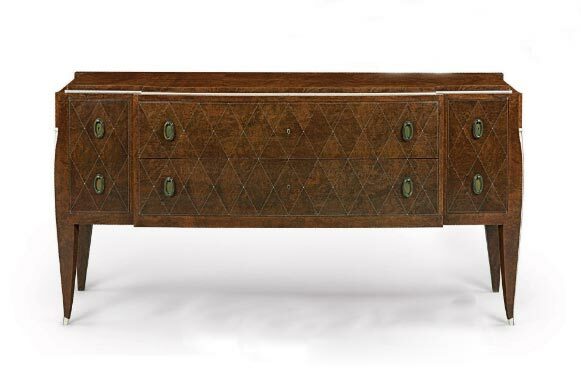 Sotheby’s New York held its early summer 20th Century Design sale on Wednesday, June 16, 2010. 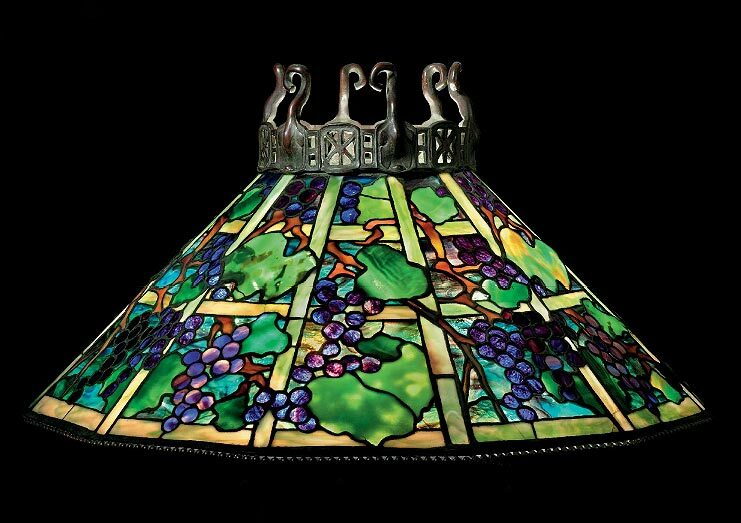 The sale began with 22 lots by Tiffany Studios, including several important lamps. The results continue a trend that has lasted decades — good Tiffany Studios items are still hot, and getting hotter yearly. The top lot of the sale was #4, a 17″ blue Dragonfly table lamp — a stunning example on a killer matching Dragonfly mosaic base. Estimated to sell for $300-500,000, it brought $554,500, near the high estimate. The second highest price of the sale went to lot #3, a fine Tiffany Studios 24″ Peony Border floor lamp, with exceptionally nice color. It was estimated to sell for $200-300,000, and sold for over twice the low estimate, bringing a total of $530,500. The sale began with lot #1, a rare and beautiful Tiffany Studios 26″ variation of the more common Poinsettia decoration. Estimated at only $120-180,000, it quickly set the tone for the rest of the Tiffany items, as it more than tripled the low estimate, bringing a total of $458,500 (see photo below). For the complete results of the sale, click on the following link. Sotheby’s 20th Century results. Christie’s New York is holding their 20th Century Design sale on Thursday, June 17, 2010, the day after Sotheby’s. And James D. Julia is holding their Important Lamps and Glass auction in Fairfield, Maine, next Tuesday and Wednesday, June 22-23. I’ll be reporting the Christie’s results on Monday and the Julia’s results next Thursday or Friday. I just added over 10 Galle vases to my website, 7 Tiffany lamps and 1 Newcomb vase. I’m spending a lot of time this spring adding new items. Please take a look. Click on this link chasenantiques.com. 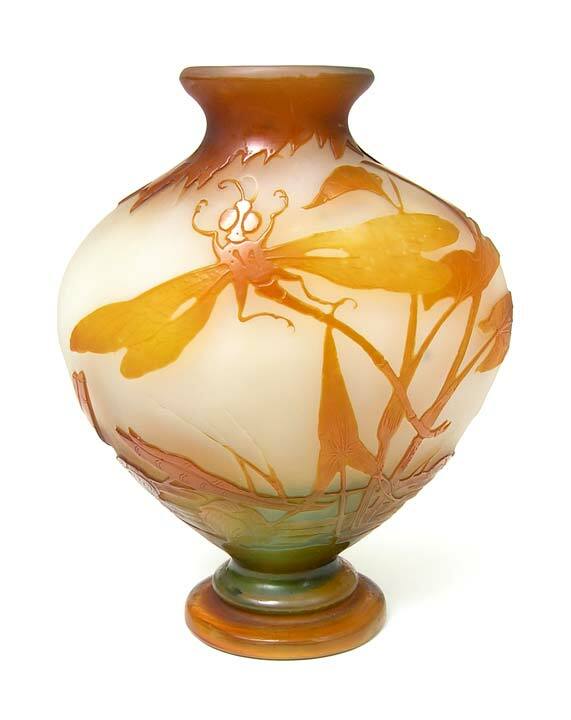 The dragonfly is the quintessential symbol of the Art Nouveau movement, so it’s understandable that the addition of a dragonfly to a French glass object is important. Of all the French glass makers, the firm of Emile Gallé most often incorporated dragonflies into their decorations. The scenes were usually ponds with water lilies, with dragonflies hovering above. 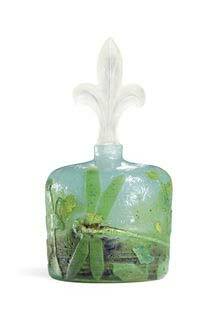 Gallé produced many vases with water lilies, but only a small percentage of them included a dragonfly. What does the addition of a dragonfly do to the value? For sure the price goes up, but by how much? Double is a good starting point, assuming all else is equal. It could be less, it could be more, but double is a good starting point. What does a dragonfly do to a vase’s desirability? As a long time dealer in French cameo glass, the answer is “A lot”. I’ll get twice as many questions at a show and sell the object in half the time. Dragonflies on Daum glass are often applied and wheel-carved. That moves it up into the realm of sophisticated glass, and sophisticated glass doesn’t come cheap. Most Daum items with an applied and wheel-carved dragonfly start at $10,000. I exhibit at shows around the country and one question that is often asked of me is “How do you get these things?” Well, here’s one day in my life that will partially answer the question. Yesterday, Saturday, was planned in advance. There were three auctions around the country where I was going to bid. That’s usually a simple matter of arranging with the auction houses to leave bids (called absentee bids) or bidding on the telephone. I don’t usually like to leave absentee bids because a dishonest auctioneer can run the bid, which means he will execute the maximum bid, rather than bidding competitively with the audience. An honest auctioneer won’t do this, but even after many years in the business, it’s difficult to ascertain the truly honest ones. I will leave absentee bids at auction houses that have proven their honesty to me. So far, so good, until a fly got into the ointment. One of the auctioneers changed some of the usual rules. He decided not to permit any phone or absentee bids whatsoever. From a business point of view, that doesn’t seem to make any sense. There are bidders who don’t have the ability or the desire to travel big distances to bid on an item. This auctioneer was closing the door on all bidders around the United States and the world, who were not within traveling distance. That makes even less sense in today’s Internet world, as bidders from remote locations have the ability to find an item and bid on it. Auctions are supposed to be competitive events where the highest bidder gets the item. To be fair, there is something positive to be said for this rule change. Those people who are willing to travel to personally attend such an auction are qualified and determined. After making the trip, they’re not going home empty-handed. They’re going to bid strongly, including on items they didn’t intend to until they showed up in person. OK, back to Saturday’s plan. My wife and I were willing to drive 4½ hours to upstate New York to attend an auction with six Icart etchings, a Gallé faience vase and a Rookwood iris glaze vase with fish. The logic was that I’m a strong bidder and there was a decent likelihood that I could go home with most or all of these items at good prices. So we left Long Island at 10:45 AM and started driving upstate. 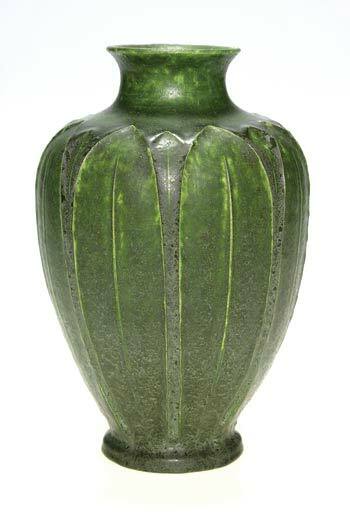 At about 11:30 AM, I got a call from auction house #1 and successfully bid on a fine Grueby vase (see photo above), but was forced to pay more than I had originally planned. But the vase is such a nice example that I’m happy to get it. We arrived at the auction house in upstate New York at about 3:30 PM and viewed the items. They were as represented, so now we had to amuse ourselves until the auction started at 5 PM. Unfortunately there was nothing in the area to do, so we aimlessly drove around until the auction began. 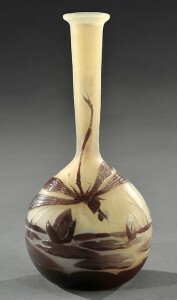 In the meantime, auction house #1 called again for me to bid on a very nice Gallé vase. The estimate was $1/1500. I was prepared to bid $1800 plus the buyer’s premium, for a total of about $2100. The bidding began at $500 and I bid $550 and then, amazingly, the bidding stopped. I bought the vase for $550 + buyer’s premium, for a total of $649. ?#%@#&?? I never look a gift horse in the mouth and this was a nice gift. Back to the live auction. First came the Gallé faience vase, a large early example that ordinarily I would have no interest in. This vase was for collectors of Gallé esoterica, and I don’t know many such collectors, so I wasn’t going to bid much. I was outbid and relieved. Then came the Rookwood vase. Rookwood sales have been few and far between recently, so again I wasn’t going to bid a lot. I was outbid again. Then at 6 PM, the auctioneer began selling the Icart etchings. First up was the best one, Bubbles. I had hoped to buy it in the $1,500-2,000 range. I bid $3,000 and was outbid by a young couple in the back, who paid $3,100 + buyer’s premium, for a total of $3,472. Disappointment! Pals, another good one came up next. Again outbid by the same couple. Drats! The third one was Silk Robe, another good one. Same result. Triple drats! This evening is not going quite as planned. I started thinking I was going home with nothing when Orchids came to the auction block. This time I was the successful bidder. Yay! Mockery and Don Juan were next and I was able to buy both. The trip wasn’t a total waste. We were able to leave fairly early at about 6:45 PM and started driving home, though at times through torrential rain. 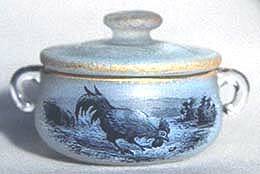 At 8 PM, auction house #3, in Florida, called me to bid on a Daum Nancy covered salt. It was the only good item in a small auction. It wasn’t well advertised and I only found out about it because the auctioneer sent me an email asking for an authentication. So I knew I could sneak up on this item and get it for a bargain. Wrong!! Again outbid, as the salt sold for $1,232. Today I’ll be adding to my website several new Galle vases that I’ve recently acquired. I added a few the other day and today more. Please take a look. Click on this link chasenantiques.com. Christie’s held an all Lalique sale at it’s South Kensington location in London on May 26, 2010. The results were solid, with a few exceptional ones. Interest in Lalique seems to be good worldwide, but always a little better in London. The top lots of the sale were three examples of the same vase, Perruches, in three different colors. The blue and the amber examples each sold for £32,450 ($46,598), against identical pre-sale estimates of £15,000 – £20,000, over double the low estimates. The green example brought slightly less at £30,000 ($43,080). Rarer items achieved better results, as would be expected. Lot 197 was a bowl with monkeys, entitled Madagascar. It carried a pre-sale estimate of £5,500 – £6,500 and sold for £13,750 ($19,745), more than twice the low estimate. A rare vase with veiled nudes, entitled Camées, sold for £10,000 ($14,360), against a pre-sale estimate of £7,000 – £9,000. For the complete results of the sale, click on the following link. 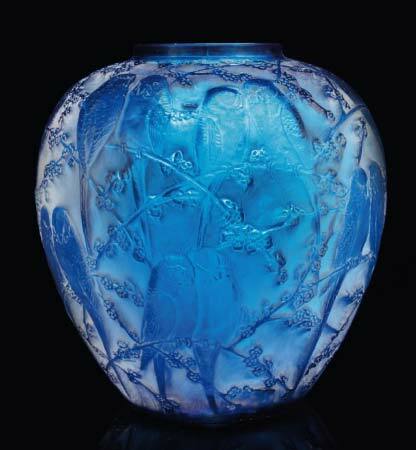 Christie’s Lalique results. Today I’ll be adding to my website several new Galle vases that I’ve recently acquired. Please take a look. Click on this link chasenantiques.com.